The saga of how one of the most famous paintings of a forest fire was created and what happened to it resembles at times an international spy thriller. An article in Forest History Today (“Untamed Art,” Fall 2008) by historian Stephen J. Pyne tracked that mystery but had no ending because no one could say where the original painting then was. Nearly a decade later, he picked up the trail. It’s the archetype globally for most prints, and probably most paintings, of a forest fire. But the reproductions come themselves from earlier reproductions. The original, Lesnoi pozhar, is a mammoth painting created by the Russian artist, A. K. Denisov-Uralsky, around 1900. The story, briefly, is this. Alexei Kuz’mich Denisov-Uralsky was born in 1864 in Yekaterinburg, grew up in the family trade crafting displays of semi-precious stones, then moved into painting, particularly scenes from the Urals; for years he was the very epitome of a starving artist. He obsessed about painting fires on the landscape, from grass fires to crown fires. His breakthrough came in 1900 with an exhibit, “The Urals in Art,” in which he displayed his climactic effort, Lesnoi pozhar, or “The Forest Fire.” More triumphs followed. He agreed to contribute the massive painting (198 by 270 cm; 78 by 106 in.) to the Russian exhibit headed to the 1904 St. Louis World’s Fair. Through various frauds and incompetence, virtually every piece of Russian art entrusted to Grunwaldt disappeared. The artists got nothing and heard nothing. Somehow Lesnoi pozhar ended up in the hands of Adolphus Busch, the beer magnate, who in 1926 hung it in the foyer of a hotel, The Adolphus, he was refurbishing in Dallas. In 1950 it was relocated to the hospitality room of the Anheuser-Busch Brewery in St. Louis. Then, in 1979, for reasons that are still murky, August Busch decided to donate the painting to the U.S. government, which, through the vehicle of the National Endowment for the Humanities, repatriated it to the Soviet Union. Ambassador Anatoly Dobrynin alluded to plans to send it to a museum in the Urals. In fact, it had again vanished. In 2014 the Yekaterinburg Museum of Fine Arts hosted a major exhibition on Alexei Kuz’mich Denisov-Uralsky, on the occasion of the 150th anniversary of his birth. It tracked down many of his fire paintings, but was unable to locate Lesnoi pozhar. The Russian embassy in Washington, D.C., refused to comment. No art or political authority in Russia knew where it had gone. Months after the exhibit had ended, however, word came that the fugitive painting may have been located in the basement of a museum in Tomsk. A photograph and measured dimensions suggest that it is in fact the elusive original. As yet no one has positively identified it nor restored it, but the curator of the Yekaterinburg exhibit, Ludmila Budrina, is confident this is the original. It seems Lesnoi pozhar has passed yet another way station on its long odyssey homeward. Stephen J. Pyne is the author of numerous books on the history of wildfire around the world. His most recent publications are Between Two Fires: A Fire History of Contemporary America and its accompanying series “To The Last Smoke.” An excerpt from Between Two Fires is available in FHS’s magazine Spring 2017 edition of Forest History Today. Ludmila Budrina wrote an update on Denisov-Uralsky’s fire paintings: “Wildfire in A. K. Denisov-Uralsky’s Canvases: Destinies of the Paintings,” Quaestio Rossica No. 2 (2015): 41-51. July 1 marks the anniversary of the U.S. Forest Service’s establishment of the National Forest System in 1907—the day the “federal forest reserves” were renamed “national forests.” Historian Char Miller wants to share his birthday wishes for them. Not every anniversary deserves commemoration. Ordinarily, the 110th birthday of anything would not merit much attention, but there is little about our time that is ordinary, particularly not for those deeply concerned about the protection and maintenance of some of America’s most beloved landscapes—the 193 million acres that constitute our system of national forests, a system that was born in March 1907. So, head to the kitchen, bake a (big) cake and dot it with 110 birthday candles; light’em up; and just before you extinguish the blaze, make a wish. Mine is simple: that these public lands will remain public. That their management will become ever-more collaborative, inclusive, and resilient, and that that these alterations in management might insure that these treasured terrains will be around to greet their 220th. Ok, that’s a lot of wishing (but then there are a lot of candles to blow out). Admittedly, too, there is little about these intertwined aspirations that is straightforward. This befits the occasion, though, for the establishment of America’s national forests was a complex and contested process—every bit as complicated as the contemporary debate over their presence and purpose. The traditional political history of their birth draws on the ideas of a three-generation set of academics, critics, scientists, and educators who, beginning in the mid-19th century, recognized that an industrializing United States was so rapidly exploiting its bountiful resources—whether timber, mineral, grass, or water—that the nation’s future was in doubt. To make the case for durable management over time required moving heaven and earth, otherwise known as Congress. Its members had to embrace the notion that a portion of the federal public domain should remain in government ownership—a radical notion for many who believed that the best use of those acres was to get rid of them. Politicos also needed to accept that the best cabinet secretariat in which to locate these lands was not Interior, where they had been situated since the American Revolution, but Agriculture. Adding to the complexity of this drawn-out process was the need for a new social type—the forest ranger—and the development of laws and expertise that would enable these stalwart individuals to more effectively and conservatively manage our resources. There is much more to this story, of course, but many of the relevant legislative initiatives, executive actions, and judicial decrees tell the same tale: The institutionalization of the Marsh’s principles was a top-down affair. Yet without bottom-up pressure from countless communities located in and around what would become first known as forest reserves, and after 1907, national forests, there would have been no political will to enact these important changes. The small Ashland (Oregon) Forest Reserve, like the sprawling San Gabriel Timberland Reserve framing Los Angeles to its north and South Dakota’s Black Hills Forest Reserve, and any number of others straddling the Rockies, came into being because of staunch local support that drew on an intersecting array of on-the-ground interests. Their vocal engagement caught the ear of representatives, senators, and presidents, shifting the political dynamic. These are baby steps, to be sure, as Catton’s tentative conclusions suggest. But they are worth lighting a candle (if not 110)—in cautious celebration of and as steadfast encouragement for much greater, collaborative-driven change in the years ahead. Char Miller is the W.M. Keck Professor of Environmental Analysis at Pomona College, a Fellow of the Forest History Society, and author of America’s Great National Forests, Wildernesses, and Grasslands (2016), Not So Golden State: Sustainability vs. the California Dream (2016), and editor of Gifford Pinchot: Selected Writings (2017). (1) George Perkins Marsh, Man and Nature; Or, Physical Geography as Modified by Human Action (New York: Charles Scribner, 1864). (2) George Bird Grinnell, “Spare the Trees,” quoted in John Rieger, “Pathbreaking Conservationist: George Bird Grinnell (1849-1938),” Forest History Today, Spring/Fall 2005: 19. (3) James Wilson to Gifford Pinchot, July 1, 1905, reprinted in Char Miller, ed. Gifford Pinchot: Selected Writings (University Park, PA: The Pennsylvania State University Press, 2017), 39–42; Pinchot drafted the letter—which was really a job description—that Wilson, as Secretary of Agriculture, signed and sent back to his subordinate. (4) Mark David Spence, Dispossessing the Wilderness: Indian Removal and the Making of the National Parks (New York: Oxford University Press, 1999); Karl Jacoby, Crimes Against Nature: Squatters, Poachers, Thieves, and the Hidden History of American Conservation (Berkeley: University of California Press, 2001), quote: 151; Theodore Catton, American Indians and National Forests (Tucson: University of Arizona Press, 2016), 15–22; Beth Rose Middleton, Trust in the Land: New Directions in Tribal Conservation (Tucson: University of Arizona Press, 2011), 36–41. Ian Tyrell, in Crisis of a Wasteful Nation: Empire and Conservation in Theodore Roosevelt’s America (Chicago: University of Chicago Press, 2015), links the domestic application of conservation to its role in framing American imperialism in the late 19th and early 20th centuries. (5) The Use of the National Forest Reserves: Regulations and Instructions (Washington, DC: U.S. Department of Agriculture, 1905), 10–11. (6) Middleton, Trust in the Land, 37. (7) The Use of the National Forests (Washington, DC: U.S. Department of Agriculture, 1907), 25. (8) Catton, American Indians and National Forests, 302. (9) Ibid., 303–04; Middleton, Trust in the Land, offers a much more robust critique of the Forest Service’s interactions with the tribes and a fuller assessment of the tribes’ own application of Traditional Ecological Knowledge on their lands; her review of Catton’s book appeared in Environmental History 22(3): 534–36. On this date in 1949, four Forest Service smokejumpers made the first jump east of the Mississippi River and the first parachute jump ever made onto the Washington Ellipse, the oval park between the Washington Monument and the White House. The jump was even televised, which is how President Harry Truman reportedly watched it, even though he would’ve had a clear view of the historical event if he’d stepped out on the Executive Mansion’s balcony. The first two men to hit the silk were Stratton, 27 years old, and William D. Dratz, 26. On a second pass, Edward J. Eggen, 26, and William D. “Bill” Hellman, 23, jumped and landed in the middle of the Ellipse. Hellman had become a new father while on the trip. His son was born the day before the DC jump. With no forest fire to attack, smoke pots were lit to provide some sense of excitement for the smokejumpers and the hundreds of spectators who turned out to watch. The Washington Post reported the next day, “It wasn’t an invasion, citizens, it was the United States Forest Service demonstrating how its smoke-jumpers fight forest fires in remote sections of the West.” Interestingly, the day before this leap into history the newspaper characterized their job as putting out fires “inaccessible to automobiles,” a indication of how new the concept of smokejumping was. Then the four men got into two convertibles and rode down Pennsylvania Avenue to the luncheon, where the smokejumpers gave plaques to business leaders on behalf of the Agriculture Department. The men were a big hit in Washington, especially Eggen, the only bachelor of the group. “Ed was the favorite of the women at the Agriculture Department,” Stratton remembered. “He was this big handsome guy with blond hair and a great smile. They pretty much had him surrounded the whole time we were in Washington.” Afterward, they quickly returned to Missoula and to work. Fire season was well underway. Some readers might recognize the name of Bill Hellman. Just six weeks later, Hellman would be one of 12 jumpers killed in the Mann Gulch fire, another, though unwelcome, first for the Forest Service smokejumpers. This is an expanded version of the review of Eruption: The Untold Story of Mount St. Helens, by Steve Olson, which first appeared in the April-May 2017 issue of American Scientist. When I visit environmental history–related locations, I typically bring back two reminders of the trip: photographs I’ve taken and rocks I’ve collected from the sites. When I returned from a trip to Wallace, Idaho, in 2009—a small, picturesque town located in the state’s panhandle and surrounded by national forests—I came home with rocks and a small vial of volcanic ash from Mount St. Helens. The vial measures about 1.75″ in length but contains a great deal of information and memory. The rocks came from outside the abandoned mine where, in 1910, Forest Service ranger Ed Pulaski and his men rode out one of the most famous wildfires in American history. Known as “the Big Burn,” the conflagration consumed 3 million acres in about 36 hours. Burning embers and ash fell upon Wallace, and fire consumed about half the town. The fire transformed the U.S. Forest Service, then only five years old; the lessons agency leadership drew from it—that more men, money, and material could prevent and possibly remove fire from the landscape—eventually became policy. The agency’s decision to fight and extinguish all wildfires, known as the “10 a.m. policy,” is one America is still dealing with because of the ecological impact removing fire from the landscape for half a century has had. Seventy years later, another famous natural disaster coated the town in ash when Mount St. Helens, which sits in the middle of the Gifford Pinchot National Forest in southeastern Washington, erupted, sending some of its content miles into the air and drifting east towards Wallace and beyond. The vial I brought back contains some of that ash. The tiny container is a reminder that this disaster, too, transformed the Forest Service. It also transformed the U.S. Geological Survey. The transformation began on March 20, 1980. After 123 years of dormancy, Mount St. Helens woke up. Seismometers had detected a 4.0 earthquake about a mile below the surface of the volcano, which is located in the Gifford Pinchot National Forest in southwestern Washington. In the days immediately following, more quakes were recorded, as many as 40 an hour. These weren’t aftershocks—it was a volcanic swarm. Business owners, loggers, and the media demanded to know when the volcano was going to blow. As Seattle-based journalist Steve Olson discusses in his book Eruption: The Untold Story of Mount St. Helens (W.W. Norton, 2016), there was no easy answer: The science wasn’t there yet. But as Olson demonstrates, the lack of clear scientific guidance and an absence of straightforward jurisdictional relationships fostered government inaction at all levels, with disastrous results. Given recent seismic activity around Mount St. Helens (earthquake swarms were recorded in June and November of 2016, although these gave no indication of imminent danger), revisiting the events of 1980 seems especially timely. Just after the March 20th quake, some immediate protective measures were taken. The Weyerhaeuser Company, which was harvesting some of the last old-growth timber on its land surrounding Mount St. Helens on land it had owned since 1900, evacuated its 300 employees, and the Washington Department of Emergency Services advised everyone within 15 miles of the volcano to leave the area. But within a week, restlessness set in. After all, livelihoods were at stake. Area law enforcement couldn’t keep U.S. Forest Service roads closed to the public indefinitely and, given Weyerhaeuser’s economic and political influence in the region, public safety officials dared not close roads on its land. Beyond that, law enforcement simply didn’t have the resources to staff all the roads that snaked their way through the forest and around the volcano and nearby Spirit Lake. Ninety years ago this spring, a major repair project began on the White House in Washington, DC, that ultimately yielded wooden treasures. Work began in March of 1927 to remove large sections of the building’s roof in order to replace wood timbers with steel trusses and undertake a full remodeling of the third floor. This project was necessary due to some structural defects, along with the overloading of the building’s upper-most story. Originally designed as attic space, by 1927 the space had been providing significant storage space as well as servants’ quarters for too long. The roof structure being removed and replaced had been erected between 1815 and 1817 following the burning of the White House by British troops during the War of 1812. White House during roof removal process, March 1927 (click for more info). Remodeling was completed by August 1927. During the construction, the majority of the wooden roof timbers removed were found to still be in good condition. Due to significant public interest in having souvenirs made from the White House wood, a public auction was held for the roof trusses as well as other miscellaneous pieces of removed lumber. 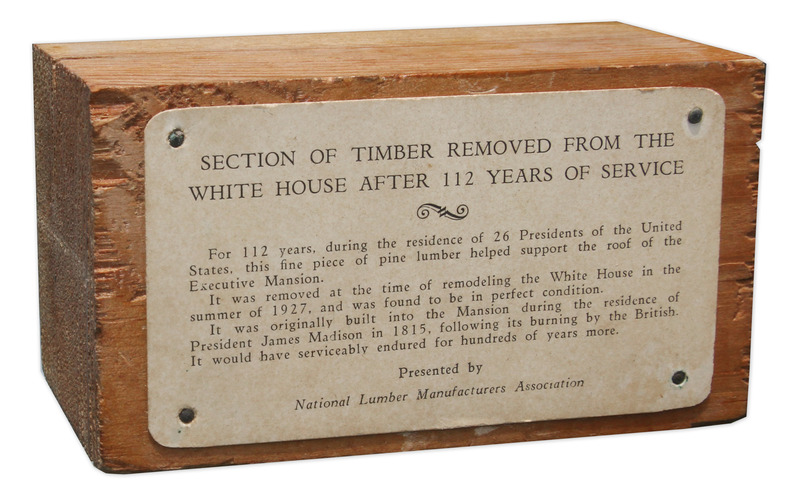 In March 1928 more than 1,500 linear feet of Virginia longleaf pine lumber from the White House was auctioned off. The highest bid (at $500—a relative steal) came from the National Lumber Manufacturers’ Association (NLMA), and they ended up with the largest lot of timber. The NLMA and other organizations that bought the lumber planned to turn it into souvenirs to give away. NLMA gavel made from White House wood (housed in FHS Archives). As a climax to his able address, Dr. Compton lifted from the floor and placed it on the speaker’s table a curious little antique settee or as it really was, a humidor of obvious pine manufacture. It proved to be a replica of a bit of furniture that was in the White House at Washington under the Madison administration during the War of 1812, and that may have been burned when that building was destroyed by the British soldiers. The settee was reconstructed by President Madison’s orders from material taken from the roof timbers after the fire, and more recently the present replica was constructed from pine again from the White House roof—lumber that had come through more than a century of service as sound as when it went in. 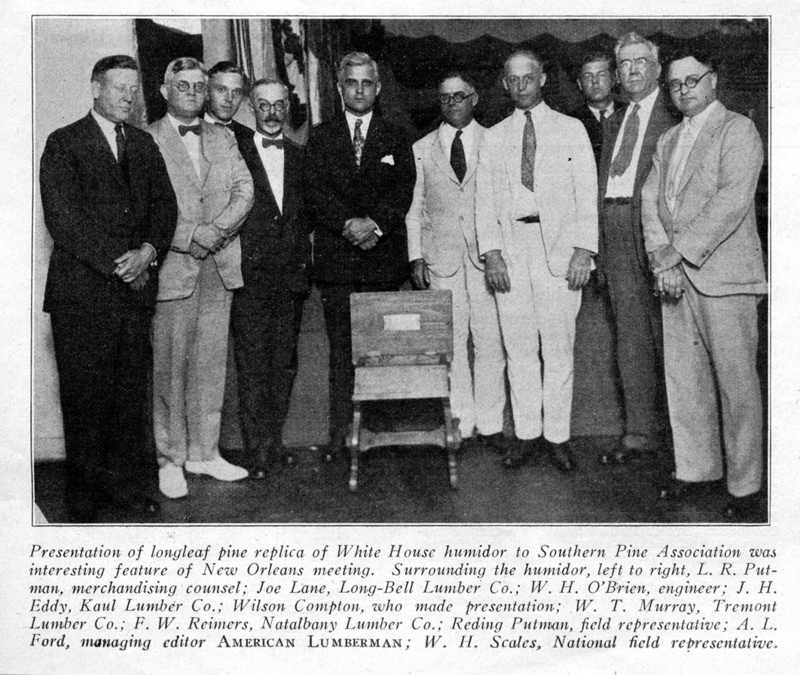 H. C. Berckes, secretary-manager of the Southern Pine Association, receives the humidor from the NLMA. The NLMA wasn’t alone in turning White House wood into wares. First Lady Lou Henry Hoover fashioned gifts from wood salvaged from the president’s home, though there is some debate over whether the wood she used came from the 1927 roof reconstruction or following repairs due to a 1929 fire in the Oval Office. Regardless, Mrs. Hoover had Christmas gifts made for family, friends, and White House staff in 1930. The First Lady sent some wood to Biltmore Industries in Asheville, North Carolina, where it was turned into ash trays, stamp boxes, paper knives, book ends, pen holders, and other small items. You can read more about the gifts made by Mrs. Hoover on Hoover Heads, the blog of the Herbert Hoover Library and Museum. The enduring quality of the original wood, the uniqueness of their source, and their direct connection to American history, make these items increasingly valuable. You’ll see the various pieces pop up at auction periodically—and typically be sold for far more than the $500 the NLMA originally paid for its entire lot of wood. For more information on the history of the NLMA, see the National Forest Products Association Records in the FHS Archives (in 1965 the NLMA changed its name to the National Forest Products Association). As the Master’s Tournament gets underway at Augusta National Golf Club this week, one of the icons of the course again will not be there. The famed Eisenhower Tree suffered extensive damage from an ice storm in the winter of 2014 and was removed shortly thereafter. Approximately 65 feet high and 90 years old when cut down, the native loblolly pine tree, named for President Dwight Eisenhower, stood about 210 yards down on the left side of hole no. 17. Ike was a passionate golfer and became a member of Augusta National in 1948. The tree was named for Eisenhower because of his inability to avoid hitting it when playing the hole. As a result Ike quickly became obsessed with the tree. As Supreme Allied Commander in World War II, Ike had led millions of soldiers in what he called “the Great Crusade” to defeat Nazi Germany. In 1956, he waged what might be called his “golf crusade.” He loved everything about Augusta—except that tree. But for the life of him, he couldn’t defeat this lone wooden soldier. At the December 1956 Club meeting, he petitioned to have the tree cut down, something that was never going to happen. Club chairman Cliff Roberts claimed later that he quickly adjourned the meeting to avoid the issue or embarrassing the president of the United States. In 1965, Ike half-jokingly confided to a golfing buddy that he wanted to use “about one half stick of TNT” to “take the damn thing down.” In the end, the tree bested the greatest military commander of the 20th century. After the ice storm in 2014, Augusta National determined that the Eisenhower Tree needed to be removed. 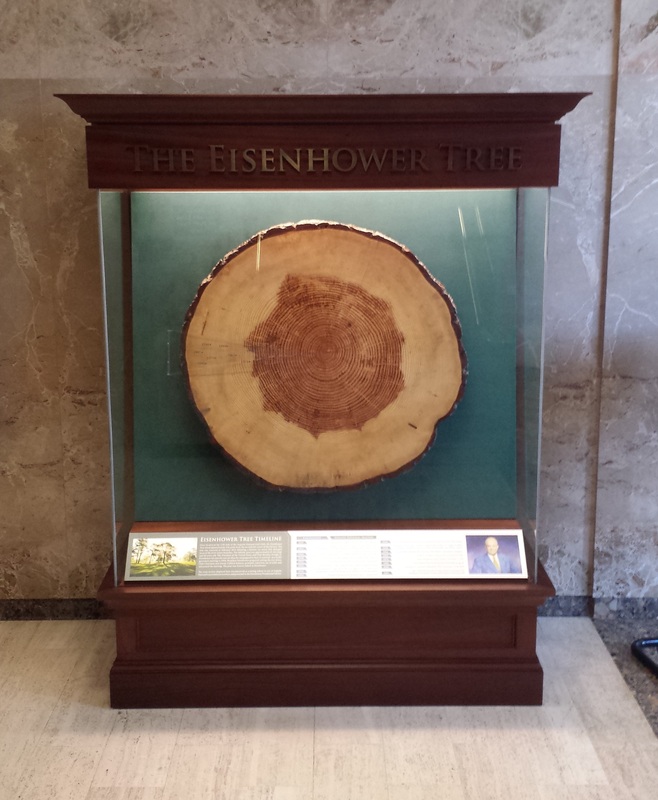 The man was so closely associated with the tree that the club had a cross-section of it sent to the Eisenhower Library in Abilene, where it is on display just off the lobby. Historian Catherine Lewis, in “Don’t Ask What I Shot”: How Eisenhower’s Love of Golf Helped Shape 1950s America (2007), gives us a cultural history that documents Ike’s love of the game. Eisenhower sought refuge in the sport from the stresses of the presidency, though he never totally left the job behind. How could he? He played more than 800 rounds during his 8 years in office. He tried to practice his short game every day. Since he couldn’t go to a course to do so, the United States Golf Association paid to install a putting green at the White House. Unlike some occupants of the White House, according to Lewis, Ike never had a problem with being photographed playing the game (though he did with having his scores reported). Those photos were often featured on the front page of newspapers, even if they had nothing to do with the accompanying story. Critics seized on the frequency with which he played as evidence that he cared more about his golf score than he did the job. Political cartoonists frequently portrayed Ike on the golf course as well, which only added to that impression. It was only after historians could access his administration’s records that it was revealed how engaged he was as president; it was not uncommon to have meetings and make major decisions while playing. This cartoon appeared in the July 1953 issue of American Forests magazine to accompany an article about the annual fire prevention campaign. Published just six months after he took office, it demonstrates how quickly Ike had become associated with golf. Lewis also examines the issue of Ike playing a sport associated with white elites in the Deep South at a segregated club. This placed him in an odd situation as the civil rights movement became a major issue during his second term. She devotes half a chapter exclusively to Ike and civil rights. His friends and playing partners were no different from him in attitude and beliefs about race. His favorite caddy may have been African American, but “Ike believed that fair access and economic opportunity did not necessarily mean social equality, indicating that his views on race, like the majority of white Americans, were still rooted in the nineteenth century.” Eisenhower reluctantly dealt with civil rights. When the school desegregation crisis in Little Rock came to a head in 1957, “Ike was accused of running the presidency from a golf course,” writes Lewis. “A brief look at his September calendar that year shows that this was in fact the case.” He complained about leaving a golfing vacation to return to the White House to address the nation about the Little Rock crisis. While she notes that in 1953 “Ike began a crusade to break 90 at Augusta National,” I would argue that he was all for leading crusades, even one against a tree, but was unwilling to lead one against desegregation of the South. The larger purpose of “Don’t Ask What I Shot” is to look at how the golf-obsessed president transformed a sport associated with the wealthy and elite into one for the middle class. Ike came from a hardscrabble background, growing up in Abilene, Kansas, at the dawn of the 20th century. He took up the game while a young officer in the U.S. Army in the 1920s, and during World War II was even photographed in full uniform swinging a club. His election to the White House in 1952 and his membership at Augusta elevated interest in sport. He was an immensely popular president, and that popularity translated into tens of thousands of men and women taking up the game he was so often photographed playing. His membership at Augusta shown a spotlight on the Masters Tournament, too. In 1953, for the first Masters following Ike’s election, tournament officials braced for “a tremendous crowd, far above the 15,000 that attended” the year before. Ike didn’t want to interfere with the tournament by attending it but instead would visit the week after the tournament ended. The success of a young, charismatic Arnold Palmer at the Masters in 1958 and again in 1960, along with Ike’s association with the club and the attention his vacations there garnered, cemented the tournament’s place as one of the major events in golf after 1960. Ike and golf have been thoroughly covered by authors. There’s Lewis’s book, which is solid; there’s David Sowell’s Eisenhower and Golf: A President at Play (2007), which has the wrong year for when Ike spoke up at the club meeting; and there’s also The Games Presidents Play: Sports and the Presidency (2009), by John Sayle Watterson, which has a chapter on Ike. Virtually every biography of the man touches on the subject, too. And there are any number of books on the history of Augusta National and the Masters Tournament that mention Eisenhower the golfer. But there will always be only one Eisenhower Tree. As a fan of Ike’s, I was stunned to learn that he wanted to cut down a tree simply because it affected his golf score.